I've always felt the lack of lower level monsters in any setting; but especially the old school with its stripped-down lists. 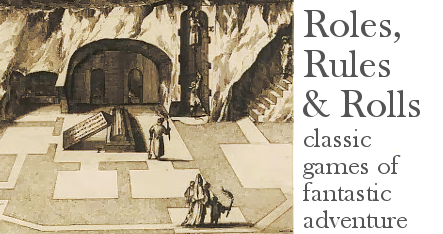 Dungeon referees who want something a little spicier than rats, skeletons and kobolds should therefore consider my new pdf supplement, available to download here absolutely gratis: Varlets and Vermin. It's a collection of monsters and related ideas for challenge levels 1 and 2, written for Swords & Wizardry but easily adaptable to other systems. Please let me know what you think and if you find it useful. Thanks! Hey, thanks for this. I haven't digested it all yet, but the Man of Wounds looks pretty intriguing, I might use him. I just finished reading through this, and I'm going to be making use of a number of your creatures. I also really like the Man of Wounds, and the rat variants are all pretty cool too. The sections on lesser undead and limiting the threat of stronger monsters were good. Useful and free can't be beat! Sounds really great, but I am having trouble downloading it. The Mediafire link times out. Very nice! I particularly loved the Man of Wounds, and the mimicking stone golem. They'll definitely be seeing action in my game soon. @sycarion - Sorry about that. I notice some blogs have pdfs directly downloaded from links - does anyone know if Blogger has a file hosting system? Otherwise, you can mail me at Rogersebastian (the usual google mail address) and I will send a copy. Thank you very much! Lots of fun and just my kind of grungy low-level goodness. I especially like the diffent strategies for humanoids and the ten tamed titans. Brilliabt stuff! Thanks Roger, it seems to be working now. Maybe it was something local to here and not a mediafire issue. Anyway, this is a phenomenal PDF. I like everything in here, even the barrel beast. To echo what others have said, I like the Man of Wounds. Looks cool, thank you very much! Is the artwork you used available on the net? If so, where? @Roger I once used to be one of those DMs that used a Mimic to induce fear. I began introducing them when they complained that I was 'too obvious'. After the first two mimics, my friends began to expect a Mimic. The fighter would give the next few treasure chests a good whack. For the non-Mimic treasure chests, this sprung a trap. So then the party decided that the thief should poke at the next one with a ten foot pole. It set off a time-delayed trap. Then they attempted to simultaneously cast Hold Monster while the thief attempted to Disable Traps. The treasure chest was an illusion that sat above a weight-based trap. Nice work! I just started work on a new dungeon and am using a few of these guys to spice things up! I only just got around to looking through this - well done and useful, thanks! I'll be using one or more of these to flavor up the low level adventuring. Whoa. This is some inspired stuff. I really love the use of old illustrations and although I've only skimmed this, it looks seriously inspired. Great work! I used the man of wounds in my game last night and it took a few rounds before my players figured out they needed to remove the weapons, but it was quite a "lightbulb" moment when they did. Thanks again! I tried downloading this, but mediafire timed out. I noticed others had the same problem. If you want to host it somewhere with fewer problems check out rpgfiles.org or google docs. In the meantime, is it possible to get a copy of the file? Managed to get a copy downloaded, despite all the problems with mediafire. Sory about those problems Bob. I have now changed the links here and in the sidebar to a Google Docs copy of V&V, just like all my other downloads. Excellent stuff! Just stocking my first megadungeon and this will be invaluable. Cheers!